Stay tuned for upcoming events for IMG Worlds of Adventure in near future. IMG Worlds of Adventure is Dubai's first mega themed amusement destination promising guests from around the globe the fervor of four epic experience zones in one area. Two of the four zones speak to prestigious worldwide brands Cartoon Network and MARVEL, while IMG Boulevard and the Lost Valley – Dinosaur Adventure zones are unique ideas made by the IMG Group.Once open, IMG Worlds of Adventure will be the biggest temperature controlled indoor themed excitement destination on the planet, covering a region in abundance of 1.5 million square feet. With the ability to welcome more than 20,000 visitors a day, the destination will include an exceptional cluster of adrenaline-pumping crazy rides, thrill rides, and spine-shivering attractions in view of prominent Cartoon Network characters, notorious MARVEL Super Heroes and hair-raising dinosaurs. Also, the destination will be home to various world-firsts, an assortment of themed retail locations, restrictive eating venues, and a 12-screen best in class silver screen. Arranged inside City of Arabia, along Sheik Mohammad Bin Zayed Road, IMG Worlds of Adventure is set to wind up an unquestionable requirement visit universal destination, conveying the best of family stimulation to Dubai's developing recreation industry. Note: Fast Track Wristband to be collected from Guest Relations Ticketing Counter! 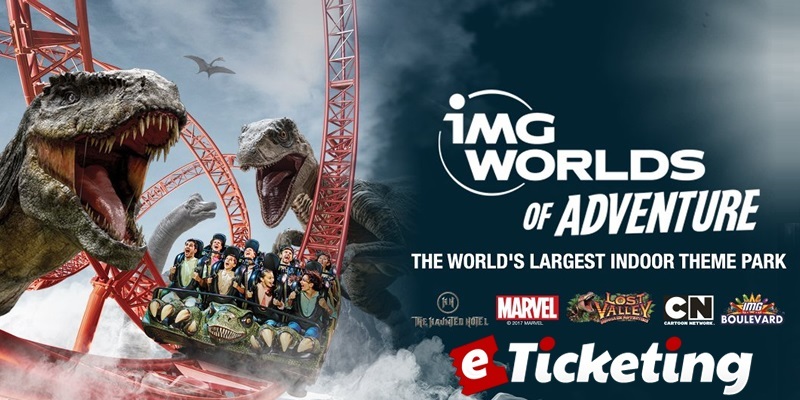 Owned by IMG Group, IMG Worlds of Adventure is Dubai’s first mega themed entertainment destination promising visitors from around the world the excitement of four epic adventure zones in one location. Two of the four zones represent renowned global brands Cartoon Network and MARVEL, while IMG Boulevard and the Lost Valley – Dinosaur Adventure zones are original concepts created by the IMG Group. IMG Worlds of Adventure is the largest temperature controlled indoor themed entertainment destination in the world, covering an area in excess of 1.5 million square feet. With the capacity to welcome more than 20,000 guests a day, the destination is featuring a unique array of adrenaline-pumping roller coasters, thrill rides, and spine-tingling attractions based on popular Cartoon Network characters, iconic MARVEL Super Heroes and hair-raising dinosaurs. Terms & Conditions : Redemption and Special T&C. *Ticket price is inclusive of VAT. *Offer valid from 10th of May to 31st of August 2018. * Block out - 20th of May to 7th of June 2018 (Park closed). Clients will present their booking voucher at the counter D and they will get 1 x 20 % discount F&B voucher. The reception will issue 1 x 20 % F&B discount voucher, the clients need to present this voucher at their selected restaurant to redeem the specified discount ie. 20% only on F&B, during their final total bill payment. They will not be able to carry this coupon/ discount voucher to more than 1 outlet. 20 % Discount on F&B on following outlets only Boulevard/ Flavour of Arabia / Mama Scano/ Changs Golden Dragon/ Spice Valley. All rights are reserved by IMG Theme Park. Best Viewed at 1024 x 768 pixels and above. This Page loaded in 0.09127 seconds on Fri, Apr 19, 2019 (06:25).